On Sunday, July 18, 25 firemen attended a propane control and confinement workshop hosted by the Petersburg Fire Department. Three instructors from the State Fire Marshal’s Training Division provided the training. Attending were fire departments from Albion, St. Edward, and Petersburg. 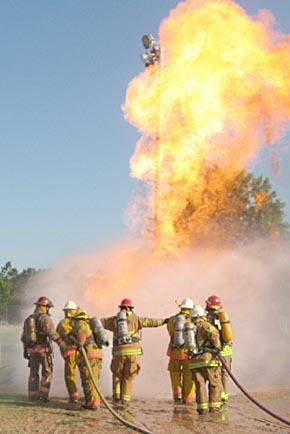 Firemen had 3 1/2 instructional hours prior to a hands-on session. The group was instructed on the correct method of advancing and cooling a tank allowing the valve to be shut off. Actual fire was used during this session. This also allowed for extra training with the air packs which must be used for many fires. There is approximately 20 minutes of air in each pack. The heat was intense and hydration was an important issue. Additional training was given on water transportation since most area fires are rural. Instructor Brian Bussie commented that Petersburg has a very young crew, but they are extremely positive and a great group.